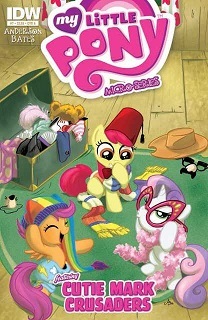 In the first issue of the My Little Pony Micro-Series that doesn’t feature one of the “Mane Six” (apparently, the original plan was just the six, but IDW saw money signs, and who can blame’em? ), we get the Cutie Mark Crusaders (Apple Bloom, Scootaloo and Sweetie Belle if you’re not clued up on your ponies). Hey, wait a minute, didn’t Apple Bloom sorta kinda feature as part of the Apple family last issue? She’s becoming an issue hog. Anyway, the trio encounter a mimicker (scientific name Globulus improbulus) which they name Imp when they find fake Latin too hard to pronounce. Imp can mimic anything, with the odd exception of ponies (though dogs, we find out, are perfectly fine). Imp is a young mimicker, so she (the Crusaders just assume she’s a girl, because they want her to be, and this comic is not going to have Twilight Sparkle explain how to differentiate the sexes of the common mimicker) constantly mimics everything, before finding a suitable form to take as an adult. The CMC see a common bond here, but, just as they arbitrarily assigned a gender to the creature, they don’t stop to find out what Imp would like to transform into before turning her into an entire orchestra, among other things. The story is by Ted Anderson, and it feels like a complete story. If there is one complaint to bring up about this Micro-Series in general, is that some of the issues felt even shorter than they already are. This one feels like a full issue, though it’s not the most exciting or funniest issue in the series. Ben Bates is art, though, so that’s always a plus. 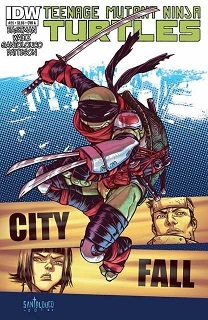 In this issue of Teenage Mutant Ninja Turtles, everybody’s plotting against everyone else. Let’s see, the leader of the Savate ninjas is plotting against Shredder, who is plotting against the Savate while also plotting against the turtles. Meanwhile, Karai is plotting against Shredder, while Alopex is plotting against Shredder independently, despite the fact that they would probably do better plotting together. Oh, and Old Hob is plotting something for Splinter to do. Old Hob is presented as one of those crazy survivalists with way too many guns in this issue. He even tries to give a gun or two (or twenty) to Splinter, but we’ll see how that works. All these plots being plotted by plotting plotters, however, mean that there’s not actually a lot of plot being moved forward in this issue. It’s mostly expository. I just noticed that Bobby Curnow is now helping with the story, along with Kevin Eastman and the actual script writer, Tom Waltz. Mateus Santolouco continues to put out interesting art for the series; besides the actual art, the panels on the page are arranged with some complexity, but it never gets confusing which panel is supposed to be read first. And now we know why Alopex is plotting against Shredder. I don’t know, this issue is pretty traumatic for the former Arctic fox pack hunter (point of order; foxes are not pack animals, of any species), but all these characters have their reasons for plotting against Shredder, and it would be nice if someone in the Foot was plotting against Shredder because he’s a big jerk in general, not because he was a big jerk to them specifically. 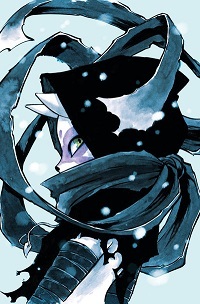 Anyway, the issue begins with a brief ninja assassination mission in which Alopex allows her four targets to fight her blindfolded in exchange for them fighting with four very specific weapons. This is a pretty big moment for Alopex; it’s the first time we’ve actually seen her win a fight. Bryan Lynch does a pretty good job selling Alopex up, because previously, we’ve only seen her lurking in the background or fighting the turtles and/or Splinter, i.e. fights she’s not allowed to win. 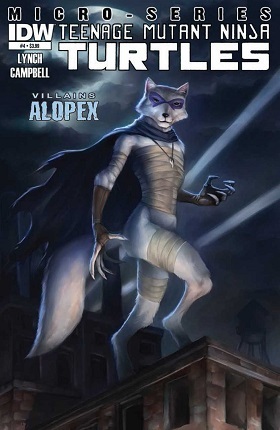 The story also does a good job selling Alopex as an actual character; yeah, I was looking forward to this issue, but I’m a furry. It’s got an anthro vixen in it. Nice to know there’s a bit of character to go with the cool character design. Ross Campbell’s art, however, really does the trick; this is basically the first time we’ve seen Alopex in a facial expression besides lurking, snarling or getting punched in the face. The line art is simple and expressive, with a limited color palette to go with the snowy exteriors of the Alaskan wilderness Alopex was born and reborn in. I think the biggest risk, and biggest payoff, is that Campbell allows our villainous vixen to be … cute. Okay, so maybe it does feature cute-ish adventures. Sue me. Your articles are always entertaining, and the fact I disagree with them often does not change that fact. Good joj.